KNOXVILLE—Exotic pests, shrinking ranges and a changing climate threaten some of the world's most rare and ecologically important plants, and so conservationists establish seed collections to save the seeds in banks or botanical gardens in hopes of preserving some genetic diversity. For decades, these seed collections have been guided by simple models that offer a one-size-fits-all approach for how many seeds to gather, such as recommending saving 50 seed samples regardless of species' pollination mode, growth habitat and population size. A new study, however, has found that more careful tailoring of seed collections to specific species and situations is critical to preserving plant diversity. Once seeds are saved, they can be reintroduced for planting in suitable locations if conditions are favorable. In the study, researchers from the National Institute for Mathematical and Biological Synthesis and the University of Tennessee used a novel approach called simulation-based planning to make several new sampling recommendations, confirming that a uniform approach to seed sampling is ineffective. First, collectors must choose their plant populations from a wide area rather than a restricted one. Sampling widely can capture up to nearly 200 percent more rare genes than restricted sampling. In addition, in most situations, collecting from about 25 maternal plants per population versus 50 plants appears to capture the vast majority of genetic variation. The study also showed that for many species, collecting more than eight to ten seeds per plant leads to high overlap in genetic diversity and would thus be an excess of effort. Increasing concerns over agriculture and food security as well as an increasing recognition of how fast biodiversity is disappearing has prompted seed banks to ramp up their collections. By the same token, botanic gardens that were once more focused on showcasing plants are now increasingly having a conservation mission too, according to the study's lead author Sean Hoban, a postdoctoral fellow at NIMBioS. 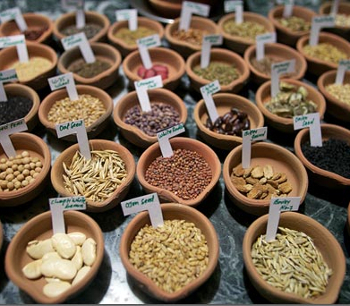 "Our approach can be used to further refine seed collection guidelines, which could lead to much more efficient and effective collections, allowing us to preserve more diversity of the world's plants. These collections could benefit future ecosystem restoration projects as well as improve agricultural and forestry efforts," Hoban said. Hoban and his colleagues are now working on ways to custom-tailor seed collections to particular species' dispersal, mating system and biology.